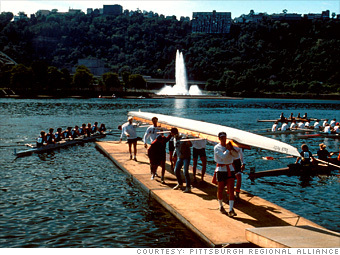  Talk back: What do you think of Pittsburgh? Over the past decade, Pittsburgh has swapped its smoke-belching steel mills for greener ventures like biotech, electro-optics, and light industrial enterprises. Help for business development is plentiful. Investment organization Innovation Works, entrepreneurial infrastructure support group Idea Foundry, and the small business development center at the University of Pittsburgh are among the resources available to entrepreneurs. Pittsburgh offers startups an array of municipal loans, tax credits, and even a few actual outright grants, such as those administered by the "Kick Start Partnerships" program.